Bronte village was settled about 1810. Located at the mouth of 12 Mile Creek (also known as Bronte Creek), it is named after one of Horatio Nelson's many titles (Duke of Bronte). Tts harbour grew over the years to be a commercially important harbour. Commercial fishing and stonehooking (retrieving stone slabs from Lake Ontario for construction) were economic mainstays. With the development of the railroads however, the commercial viability of the harbour declined. Bronte village is now part of Oakville, a large city immediately to the east. It is a lovely, quiet harbour with all of the amenities a visiting sailor could want or need. Bronte Station on the GO commuter train system links the village to Toronto in the east and Hamilton to the west with frequent, fast trains. The approaches to Bronte village are clear from all directions. An easy landmark are the cluster of tall chimneys at the Petro-Canada refinery. They are marked on the chart about 1.5 nm east of the marina. At 505 ft/ 154 meters, they are visible 26 nm offshore and are marked with RED aircraft anti-collision lights. Immediately to the east of the marina are a group of tall white apartment buildings. About 1.3 nm SW is the Petro-Canada refinery pier. It extends out into the lake approximately 2000 ft/610 meters. Both the outer Harbur and the inner Harbour have docking facilities. The outer harbour is formed by two breakwaters. The outer breakwall is marked with an ISO RED light visible 6 nm offshore. The inner breakwall is an extention of the pier on the north side of the entrance to 12 Mile Creek. The entrance to the inner harbour is marked with a Fl RED light, visible 5.8 nm offshore. It is positioned on the end of the north pier, at the mouth of 12 Mile Creek. The south side of the creek entrance is protected by an unmarked breakwater. Once inside, follow the creek upstream. Immediately on your bow will be the first marina. Continuing around the bend, you will come to the yacht club. Bronte Outer Harbour Marina is located just outside the mouth of 12 Mile Creek, on the east side. It has 420 slips with 40 set aside for transient sailors. There is a fuel dock (diesel and gasoline) and a pumpout station. Water and power are available at slips. This is a full-service marina able to carry out maintenance and repairs to engines, mechanical and electrical systems, fibreglass repairs and sail and canvas work. There are washrooms, showers and laundry on site. There is a ship's store, playground and internet access. This marina is operated by the Town of Oakville. There are no transient docking facilities available. There are no services for a cruising sailor. BHYC is located around the bend and up 12 Mile Creek. 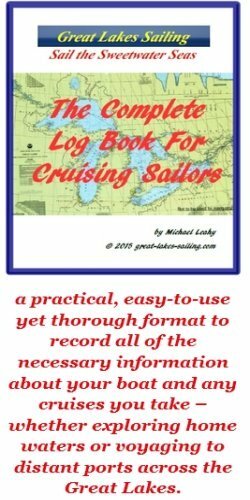 They have several slips available for cruising sailors on a reciprocal basis. Visitors can stay up to 3 nights without charge. There is no fuel dock and no pumpout station. Water and power are available. Note that mooring at BHYC is mediterranean-style. There is a club house with washrooms and showers, a dining room and bar. Other amenities include BBQ grills, picnic areas and internet access. G and B Sports Marine, located at Bronte Inner Harbour can handle engine and mechanical repairs for a wide range of makes and models of engines. Northshore Boatworks is located at Bronte Inner Harbour. They are able to carry our hull, deck and interior repairs. Klacko Spars is a custom manufacturer of masts, rigging hardware and a variety of other marine harware and fittings. It is located about 2.5 mi/4 km inland from Bronte village harbour. CO2 Inflatables is one of Canada's largest inflatable boat dealers. They stock Zodia, Carribe and Avon boats and maintain a large parts inventory. Sobey's, a major supermarket, is located downtown, about .5 mi/1 km from the harbour. Royal Bank of Canada has full counter service and ATM access. It is located downtown. Dock 16 is a chandlery located at Bronte Inner Harbour. It carried a full range of sail and power boat accessories, hardware, electronics, cleaning supplies and gifts. Oakville-Trafalger Memorial Hospital (905) 845-2571 is located 5 mi/8 km east in Oakville. It is a major, full-service hospital. Bronte Centre Pharmacy (905) 847-0002 is located about 3 blocks north of Bronte Outer Harbour Marina. Bronte village has a nice selection of restaurants to suit all tastes. Compass Lakeshore Grill is located right in the Bronte Outer Harbour Marina. It has a good, if expensive menu and service is average but it does overlook the harbour. If you love French cuisine, you simply can't pass up La Parisienne Creperie. Owned by a couple from Paris, the restaurant, a couple of blocks from the marina, is superb. Stoneboats, located about a block or so north of the marina is a very popular restaurant. Good menu and comfortable outdoor patio overlooking the harbour make this a favoured gathering place. There are 2 pubs in Bronte village - The Coach and Four and The Manchester Arms. Both serve a selection of beers and traditional pub food in a relaxed, comfortable setting. They are both located downtown. Bronte village is a lovely place to stop and relax. The Waterfront Trail, a 500 mi/800 km trail along the St. Lawrence River and north coast of Lake Ontario runs through Bronte. It offers quiet trails and walkways to enjoy. Downtown Bronte has many small specialty shops and boutiques to explore. Canada Day (July 1st) is a large celebration and mid-August sees the annual Artisans Festival. Bronte Beach lies on the south side of the mouth of 12 Mile Creek and has picnic area and BBQ grills. This link to the Bronte village tourism site will give you more ideas on what you can see and do when visiting.